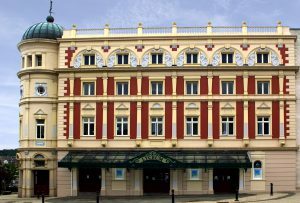 Today, it seems incon­ceiv­able that Sheffield’s beloved Lyceum Theatre could ever have been con­sidered for demoli­tion. But such a drastic move was very much on the cards when the theatre fell into dis­repair in the early 1980s as it struggled against the rising tide of tele­vi­sion and other forms of enter­tain­ment. It could have become a nightclub, a cab­aret venue or, if the city coun­cil of the day had had its way, a multi-storey car park. Sheffield once boas­ted no fewer than eight theatres, and the Lyceum was built at the turn of the last cen­tury and at the dawn of the Edwardian era by the famous Victorian theatre archi­tect W.G.R. Sprague. It is the only sur­viv­ing example of his work out­side London. In its early days the Lyceum played host to Sir Henry Irving, the greatest actor of the Victorian age and the first ever to be knighted (although he was to die sud­denly in 1905 when he col­lapsed in Bradford, having uttered his last stage words “Into Thy hands, O Lord”). As the theatre enjoyed a golden period, other famous names to appear there included Anna Pavlova and Charlie Chaplin and, in the 1940s, Sir Donald Wolfit and Noël Coward. In the fol­low­ing dec­ades, big names such as Morecambe and Wise and Albert Finney assured full houses. But the final cur­tain came down in 1968 fol­low­ing a pan­to­mime star­ring Vince Hill. The build­ing was listed in 1974, briefly became a bingo hall, and finally closed in 1979. Enter stage right David Heugh, our speaker, whose back­ground is in sales and mar­ket­ing, and his asso­ci­ate Norman White, a Sheffield soli­citor. They launched a cam­paign to save the Lyceum, and last December marked the 25th anniversary of the theatre’s reopen­ing in 1990 fol­low­ing a £14 mil­lion refur­bish­ment which safe­guarded the Lyceum’s future as a home for tour­ing pro­duc­tions. A lunch at the Cutlers’ Hall organ­ized by the Lyceum Trust, of which David is chair­man, marked the anniversary. Before the Lyceum rescue, David had been chair­man of South Yorkshire Opera, which at the time was the biggest ama­teur oper­atic com­pany in the coun­try. David and Norman were hands-on opera enthu­si­asts, and they had just per­suaded Prince Charles and Princess Diana to come to Sheffield to see South Yorkshire Opera’s pro­duc­tion of Tosca at the adja­cent Crucible Theatre in 1984 when the receiv­ers asked if the pair wanted to save the Lyceum. “The very next day I received a phone call from KPMG [the account­ancy firm] and they asked me if I knew the build­ing was empty, point­ing out that it would make a fine home for my com­pany,” recalled David. “When we went to look at it, the theatre was dark and cold, with no seats, water coming through the roof, water in the cellar and pigeons in the upper rooms, but we were still impressed by the atmo­sphere of this great theatre. David and Norman man­aged to secure a meet­ing with David Blunkett, then the leader of Sheffield coun­cil, and although a grant of £71,000 was even­tu­ally approved – after he had turned down their ini­tial request – this was not enough to pur­chase the Lyceum. However, in October 1985, with the build­ing just an hour away from being sold to the highest bidder, late night nego­ti­ations with the RBS bank res­ul­ted in the pair man­aging to borrow £30,000, and the com­bined total was enough to see off the com­pet­i­tion. The Lyceum Theatre Trust was formed soon after, quickly gain­ing fur­ther mem­bers, and fun­drais­ing began for a modest £5 mil­lion refur­bish­ment. The decision paid off and led to the wider £14 mil­lion refit – the biggest theatre refur­bish­ment in Europe at the time. A con­cert by the D’Oyly Carte Opera Company took place on the open­ing night, December 10 1990 and the rest, as the saying goes, is his­tory. David Heugh has had a varied and suc­cess­ful career as a busi­ness­man, entre­pren­eur and char­ity fun­draiser, and has had stints as chief exec­ut­ive of the Whirlow Hall Farm Trust and as dir­ector of fun­drais­ing at Freeman College, which provides day and res­id­en­tial edu­ca­tion and care in South Yorkshire for young people with spe­cial edu­ca­tional needs and dis­ab­il­it­ies. He won the Sheffield Business Person of the Year Award in 2008, but says that his greatest legacy is his ‘David and Goliath’ battle to buy and save the Lyceum. Previous PostThe Battle of the Somme 100 Years On — Anthony Bolton — 4th July 2016.Next PostHistory of the Far East (Tinsley) — Sally Rogers — 18th July 2016.